For a very long time, Insomniac’s Sunset Overdrive has been one of the, sadly, few reasons to get an Xbox One, as the game stayed exclusive to the Microsoft console until late 2018 when a PC port developed by Blind Squirrel Games got released on Steam and the Windows Store. The PC port of Insomniac’s first current generation title is a solid port that makes the game possibly even more enjoyable, despite being a pretty barebones port, lacking features that are expected out of a PC game nowadays. Right from the get-go, it’s clear how Insomniac went all out on the craziness in Sunset Overdrive, starting from the plot. Sunset City used to be like any other city in the world, with people going on about their lives until a fateful day when zombie-like creatures started appearing in the city. This wasn’t a natural occurrence, obviously, as the people of the city have been turned into monsters after drinking a very mysterious drink. A few, however, manage to resist the allure of this beverage, and they are now banding together to kill these monsters and escape from the city with their lives. There’s no term other than crazy to describe Sunset Overdrive’s story. Things hardly make sense, but the fun is hardly mindless, as the humor actually makes sense in the context of the game, and it never gets boring, unlike other games featuring the same approach to storytelling. Characters may not be all that deep, but when everything is so much fun, this isn’t an issue at all. 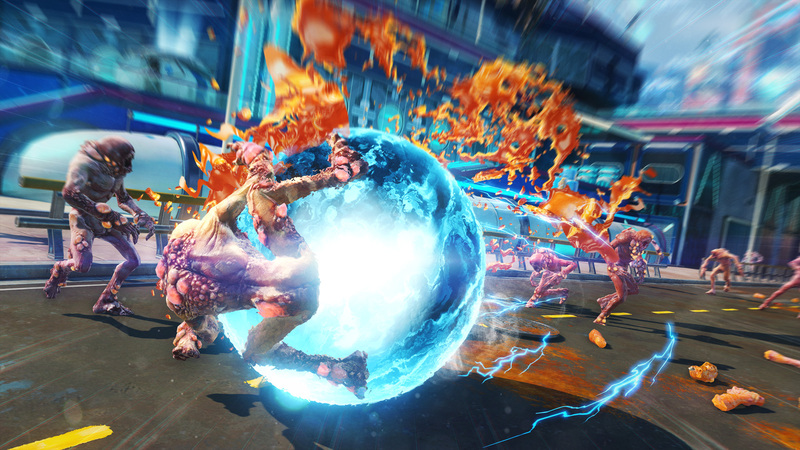 The gameplay experience of Sunset Overdrive is just as wild as its setting and characters. Right at the beginning of the game, players will get the chance to get accustomed to the craziness of Sunset City by creating their custom character through a robust character creator. Once your character is made and ready to go, it’s time to get on this crazy ride, which keeps delivering from beginning to end. 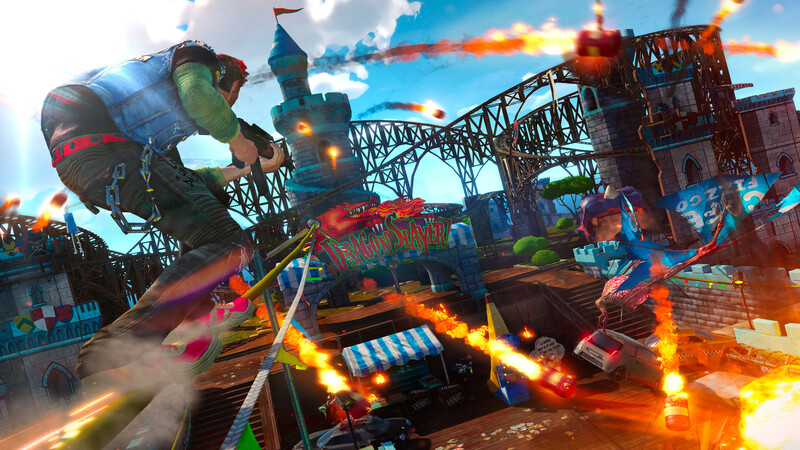 The Sunset Overdrive experience is unlike any other seen in open world games. While the basics are those we have seen in many other games – go to a specific location to begin a quest, then head over to another to complete it and unlock one more quest and so on -, it’s the frantic action that sets it apart from anything else. The creatures that have overrun Sunset City are unlike traditional zombies, especially in regards to their mobility, as they are fast and relentless. In addition to that, the city’s layout doesn’t provide any reliable cover spot. For these reasons, trying to take them on on the ground is effectively impossible in Sunset Overdrive. This is where the parkour system comes into play, helping players always stay on the move. At any time while traversing Sunset City players can run up walls and grind across buildings thanks to a system of power wires. They can even grind on railings and fences as if this was a skateboarding game. It may take some time to get used to the game’s high-speed experience, but once the movement and parkour systems have been mastered, performing tricks and combo kills becomes incredibly satisfying. 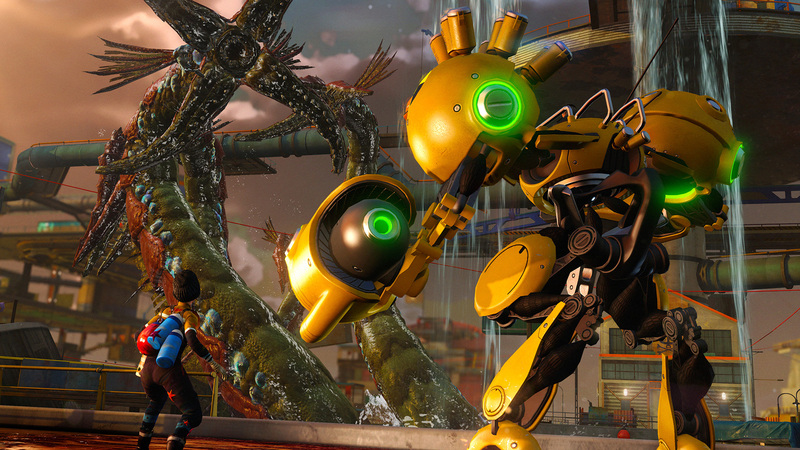 Insomniac wasn’t new to these systems, but in Sunset Overdrive, they have brought what they introduced in older Ratchet and Clank games to a new height. The developer also got incredibly creative with the weapon selection. At the beginning of the game, players will only have a flame-throwing shotgun and a rifle that shoots vinyl discs, but soon enough, the available weapons become crazy, with rifles shooting bowling balls and so on. Each weapon can also be improved through the Amps system, so most weapons are viable to progress through the game. Enemy variety is excellent, ranging from your run-of-the-mill creatures to those armed to the teeth with more crazy weapons that will make your time in Sunset City not all that pleasant. Mission variety, on the other hand, is not all that great, as most missions just involve killing enemies, but it’s well hidden by the fact that they will bring you in different areas of the city coming with some unique gimmicks. Weapons and the enemy variety aren’t the only features that spice up the Sunset Overdrive experience, as Amps also allow players access a variety of perks unavailable otherwise. Amps, divided into five different types, are acquired by different means, allow players to shoot out fireballs with melee attacks, deal increased damage while in the air and so on. These amps activate after reaching specific style levels, making it even more important to master the parkour system to rack up combo kills. All of the game’s mechanics shine even more when tackling challenges. These optional tasks are focused on different mechanics, like the parkour system, combat and so on, and they are just perfect to learn more about them and earn some nice rewards as well. Speaking about rewards, the game often throws new customization items at the player, so you can continue modifying your character during the course of your adventure in Sunset City. As mentioned at the very beginning, the PC port of Sunset Overdrive is competent, but leaves a lot to be desired, as it’s pretty barebones. The ability to finally play at framerates beyond 30 FPS is a definite plus, but the rest of the graphics options don’t allow much customization. The game also lacks support for the 21:9 aspect ratio, so those with ultrawide monitors will have to deal with black bars at the side of the screen. The improved resolution, just like the better performance, is a godsend, making the vibrant and colorful look of Sunset City better than ever. While it’s possible to look past the lack of advanced graphics options, there is one feature lacking over the original Xbox One version that’s much harder to swallow. The co-op options, which allow multiple players to play through the game together, is missing completely from the PC port, a true shame, considering how fun multiplayer is on Xbox One. Sunset Overdrive on PC is just as good as it was on Xbox One, with its crazy world and gameplay, barring the glaring lack of the co-op multiplayer features. Even though the game also lacks advanced graphics options, the PC port developed by Blind Squirrel Games is a competent one that mostly does justice to the original console release. Review code provided by the publisher. You can purchase the game for Steam via Green Man Gaming.